The Water Quality Sampler System Controller's LCD display shows the type of sensor that is being monitored, the data reading averaged over a user programmable time period, and the engineering units selected. The display also shows the current On or Off state for each of the process controller's 4 relays. Each of the process controller's relay is independently programmable to trigger on maximum and/or minimum threshold levels in one of five different control modes. Relay operation is defined by setting upper and lower sensor threshold levels and turning relays on when process controller sensor readings exceed a normally defined range. 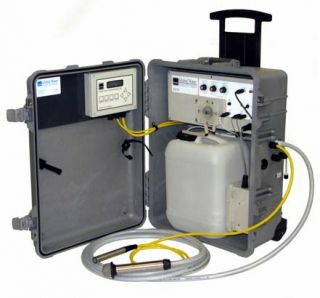 Visit the Water Quality Sampler System Controller page for more information. Global Water triggered Water Quality Sampler System Samplers are enclosed in rugged, rainproof, lockable carrying containers. Inside each standard water quality sampler container is a 2-gallon polyethylene waste water sample bottle for collecting composite samples, a peristaltic sampling pump, two knob control panel (No programming required) and a rechargeable gel cell battery. Other options include glass sample bottles, refrigerated containers, portable ice containers and more. Visit the WS700 Water Quality Sampler page for more information on the Water Quality Sampler System Sampler. Global Water's Water Quality Sampler Data Recorder works with MS Windows software. The Water Quality Sampler Data Recorder monitors and logs both water quality value and time of the sample for your records. Data downloaded from the Water Quality Sampler Data Recorder can easily be opened in any PC spreadsheet program for analysis and graphic presentation. Visit the Water Quality Sampler Data Recorder page for more information.